BUT, it rained all.day.long so I spent the entire day switching out the girls' (and Baby Boy's) closets...boy was that fun. Ha! Switching clothes is probably the mama job I dislike more than any other. This fun task did give me a great opportunity to watch some episodes of my new fave show on Netflix...Drop Dead Diva. It is soooooo good! 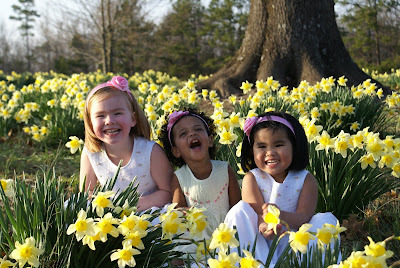 And I am excited that the little girls have a closet full of cute, Spring dresses :o) I LOVE this time of the year!!!! The original songwriter wrote the line "So Heaven meets earth like a sloppy wet kiss," but Dave Crowder asked for the line to be changed to "....an unforeseen kiss." I understand the reasoning, but I like the original line MUCH better :o) Who doesn't like a sloppy wet kiss? My girls give the best sloppy kisses in the world :o) Unforeseen or sloppy, I still HEART the song and it is one of my faves!!! Now, on to the big news of the day...Brad and Emily...thoughts? Ha! :) I watched last night, too. I was so excited that he chose Emily, but I'm not sure it's going to end well. They did not have happy body language! Love David Crowder! Got to see them this past Friday at Winterjam and had to download their album immediately!